4 What don't you want to do? Everyone says the best way to live your life to the fullest is to simply follow your passion. It may sound simple, but to follow your passion, you need to find it first. While you may have a stellar work ethic, you may be determined and dedicated, and you may be will to make the sacrifices and do whatever it takes to succeed, but you need to have something to work towards. However, how can you find the passion can seem overwhelming and even frightened. This article will help you find your passion and encourage you to pursue it! You may be thinking that finding your passion is impossible or hard. With this mindset, you are already setting yourself up for failure. You won't be open to possibilities, opportunities, or the signs that could show up that you are on the right path. Instead, change your mindset to one that is open, positive, and excited about finding your passion. This might mean trying new things, finding new people to hang out with or just learning something new. When finding your passion, you really want to look at all the areas of your life and see what really makes you happy, excited and fulfills you. Think about all the jobs you have had, the experiences you've had, and what you enjoyed learning more about. Make a list of all the things that you enjoyed doing from interacting with other, being a leader, teaching, to using your hands to create or being active and fit. These things will begin to show you where your real interest lies and what you enjoy doing. Once you have your list, you want to ask yourself some very important questions. Could you read every book on what interests you and not get bored? Would you pursue this interest for five years without ever getting paid? If money was not an issue, what would you spend your time doing? Asking these simple questions will help you determine what you are really passionate about. How to find your passion isn't just about figuring out what you would love to do. You also want to take into consideration what you would hate doing. When you take the time to eliminate jobs or tasks that you would despise doing, your passion can become more clear. Don't rule out things that you may be just OK at doing. Often time, the things that you are mediocre at doing can be combined to form your passion. Maybe you enjoy making art, but your artwork isn’t spectacular. Maybe you also have a great sense of humor. If you combine these two interests, then you can consider being a cartoonist. This can work for many areas of interests if you take the time to really look at how they can work together. One of the best ways to find your passion is to use visualization. What can you see yourself being excited about doing every day? What will make you jump out of bed in the mornings? Begin by simply seeing yourself getting up in the morning and being excited about the day. Go through the process of getting ready to go to work, the clothes you will wear, how you will get there and really visualize where you are going. You might find form your list you have a number of things that really spark your interests. You need to ask yourself “is this something that you can really benefit and profit from”. Think clearly about how those things that interest you can be turned into a career. Ask yourself if this is something you would really enjoy doing every day even on the days you don't feel like it. Also, consider the amount of work you have to put into making this a reality. 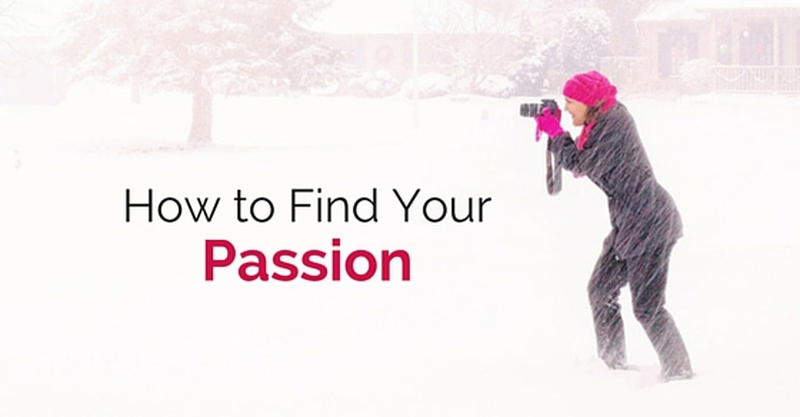 How to find your passion may not be as simple as finding something you love to do. You might have to acquire new skills to actually make it a profitable business or career option. When you are thinking about what you are passionate about, you might find it easy to stick with things you are good at doing but that you don't get much joy out of. That is not where your passion lies. Your passion will be found in the things that you really love to do even if you don't think you are really good at them. Identify the things you really enjoy doing and give yourself permission to pursue those interest first. By doing so, you may find you have much more potential that you could never have imagined. There are bound to be a few people you interact with on a daily basis that seem to get under your skin. It could be because they seem frivolous or annoy you because of the way they live their lives? What is it about them that is really upsetting you? There is a good chance that your annoyance with them is simply because they are doing something that you only wish you could do. Instead of being annoyed with them, try following what they do. When you don't enjoy doing something, you will tend to agonize over how slowly time goes. When you are really passionate about something, time doesn't matter. How to find your passion? It is all about finding what you can spend your time doing and not care about how much time you are spending on it. When you pursue your passion, you will often lose track of time. When you are on the hunt to find your passion, you really want to enjoy the process. You want to do things that make you laugh and excite you. Don't think of finding your passion as a daunting task or chore. Enjoy the process and you will be able to be more open in finding what you really want to be doing. While finding your passion, you may want to be able to make a living from doing this particular job. In many cases, finding your passion has nothing to do with the money you will make from finding it. While you want to be realistic because you need money to survive, do not discard what you love just because at the present moment you can't find a way to monetize it. When you find your passion, money won't be a concern. You will simply enjoy doing it every day and eventually you will figure out how you can make a profit from it.